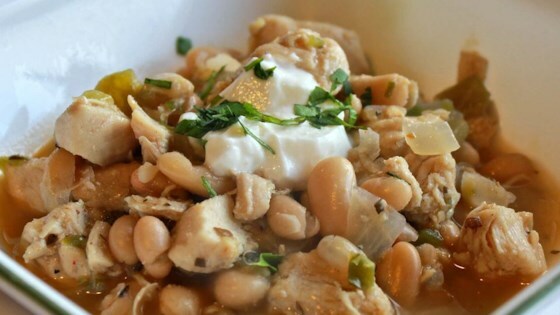 "Delicious white bean chili. Cha Cha says: 'It's kinda spicy, so watch out!' Substitute mild green chiles for the jalapenos if you're scared! Use more chicken and cheese as desired." Heat the oil in a large saucepan over medium-low heat. Slowly cook and stir the onion until tender. Mix in the garlic, jalapeno, green chile peppers, cumin, oregano and cayenne. Continue to cook and stir the mixture until tender, about 3 minutes. Mix in the chicken broth, chicken and white beans. Simmer 15 minutes, stirring occasionally. Ok, I was sick, so I wasn't particularly thrilled.